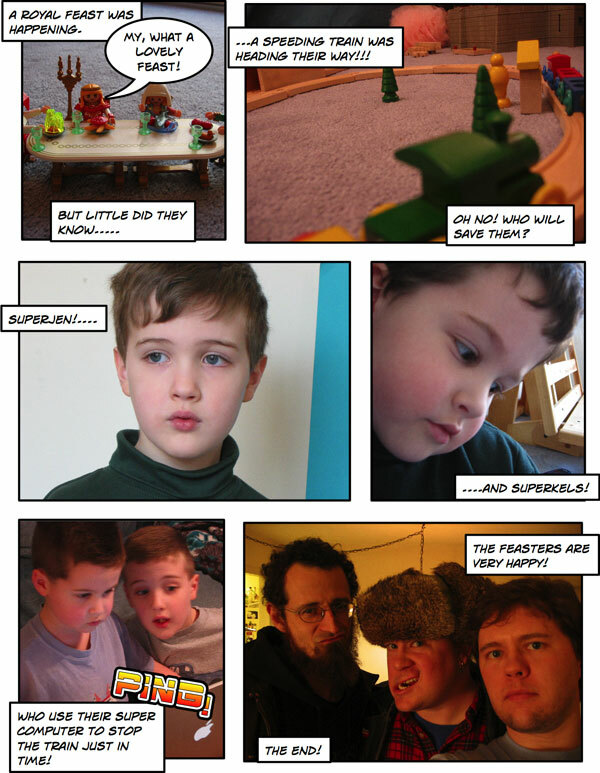 I showed Comic Life to the boys. The program has an integrated iPhoto browser, so they have my full seven-and-a-half-year, 26,000-image photo library. There was no stopping them. Well, other than limiting them to one comic each for starters. Here’s Jen’s. 3, 4: Jen and Kels, 17 January 2003; 5: Kels and Jen, 22 April 2003; 6: Argus, Bonkydog, and me, 26 December 2002. The basic layout is one of Comic Life’s many built-in page templates, providing empty frames into which you can drop photos and overlay text boxes and graphic lettering. I only suggested that he narrow the text boxes to fit the copy (since Comic Life doesn’t do that automatically) and change the “Ping!” from a text box to a lettering item. Other than those tweaks (which he approved), it’s all Jen.